Tevatron Machine Will Smash Particles No More On Friday, officials shut down the giant machine designed to smash tiny bits of atoms together to reveal fundamentals of the universe. For a quarter century, the Tevatron, located in a lab near Chicago, was the most powerful and productive machine of its kind in the world, but a new machine in Europe has made it obsolete. Physicists who study the most basic building blocks of the universe have just said goodbye to a beloved giant in their field. Not a fellow scientist, but rather, a machine. 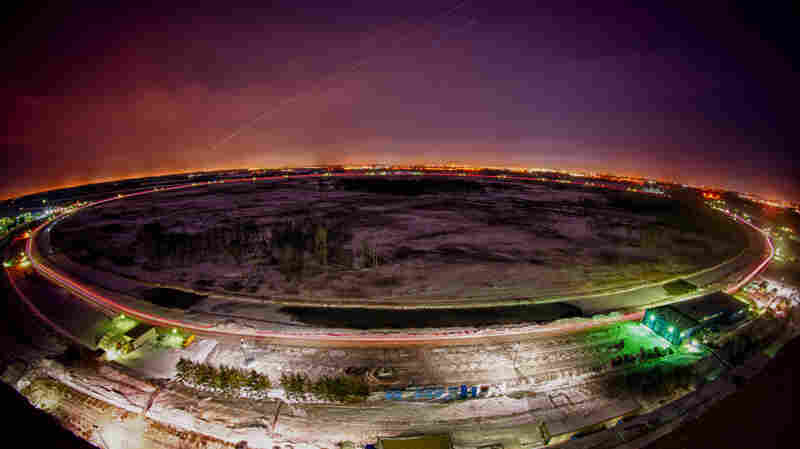 A huge device near Chicago called the Tevatron. This machine has certainly opened windows on the universe that you couldn't imagine opening before. It's done a great job. For about a quarter of a century, the Tevatron was the most powerful machine of its kind in the world, but scientists gathered Friday to shut it down in a brief and bittersweet ceremony. The Tevatron, located at the Fermi National Accelerator Laboratory in Illinois, was designed to reveal the mysterious innards of tiny atoms. To do that, the machine had to be really complicated and really big. 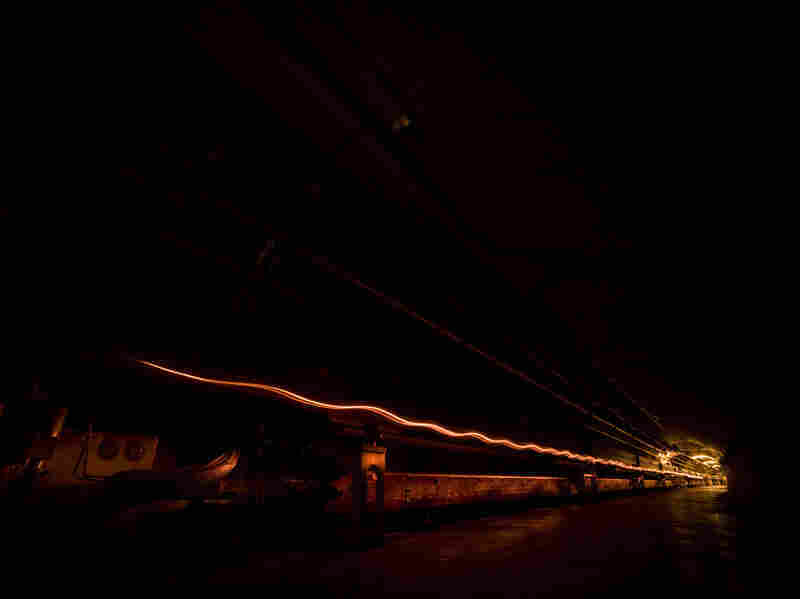 It sent bits of atoms racing through an underground tunnel four miles around. Protons and antiprotons sped up to nearly the speed of light, then smashed together so that scientists could sift through the subatomic rubble for clues about hidden particles. "It was a very interesting machine to work on in the first place, because we knew we were building something that had never been built before," said Roger Dixon, who has worked at Fermilab for more than three decades. He says people who worked closely with the Tevatron felt the machine had a real presence. "It definitely has a personality, and that started right away," Dixon said. "It had an attitude at the beginning." Tiny particles of atoms, protons and antiprotons were sped up to nearly the speed of light and smashed together. The underground tunnel, above, was four miles around. Scientists sifted through the subatomic rubble for clues about hidden particles. As one operator wrote in recollections posted by Fermilab: "The Tevatron does not forgive mistakes and it punishes those who have the temerity to think they know what they're doing. The Tevatron taught me humility and gave me paranoia." Dixon says caretakers endlessly battled things like floods, blizzards and weird equipment failures to keep the Tevatron running 24 hours a day, seven days a week — because it was worth it. "This machine has certainly opened windows on the universe that you couldn't imagine opening before," he said. "It's done a great job." For example, the Tevatron is where the top quark was discovered — confirming scientists' predictions about the fundamental nature of matter. And the technology inside this machine laid the foundation for an even bigger and more powerful particle collider that's just fired up in Europe, the Large Hadron Collider. That collider is what finally made the Tevatron obsolete. The Tevatron does not forgive mistakes and it punishes those who have the temerity to think they know what they're doing. The Tevatron taught me humility and gave me paranoia. Decades ago, a physicist named Helen Edwards led the construction of the machine. On Friday, she stood in the Tevatron's control room, where she had the honor of shutting it down, in a ceremony that was broadcast online. When operations expert Bob Mau gave her the go-ahead, Edwards pushed a big red button. He pointed to a computer screen. "As you can see on the red display, the line has gone to zero," Mau announced, "so there is no longer any colliding beams of protons and antiprotons in the Tevatron." Then he told Edwards to push a blue button, to turn off power to its 4-mile ring of superconducting magnets. The light on the button went off, but for a long moment nothing happened on the computer screen. Then, a green line began to drop. "There it goes," Mau said. "It didn't want to give up so easy!" A New Force Of Nature? The power faded away, and that was that. The Tevatron's Twitter feed and Facebook page announced simply, "It is done. The Tevatron is now off." Fermilab invited all its scientists to a party, a kind of wake for the beloved physics instrument. The researchers will now turn to other experiments, and the lab hopes to build new physics machines to probe elusive particles like neutrinos. The silent Tevatron will eventually be opened up for public tours, to let people see the machine that was once the greatest in the world.